and did I mention tastes so good?! 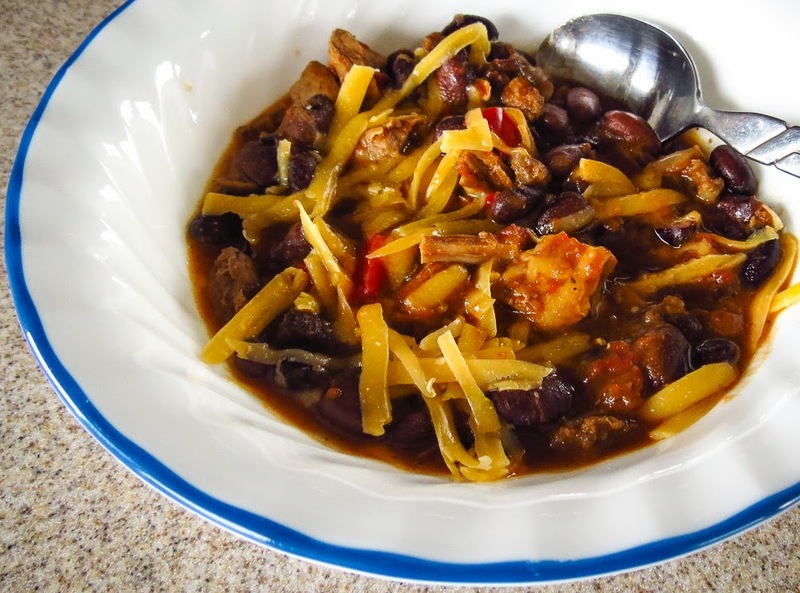 Disclosure: there are beans in this red-sauced pork chili recipe. Beans? I'm not about to enter the battle discussion regarding beans vs no beans in an authentic chili (link and link), or even worry about whether pork chili requires red sauce or green sauce. I'll leave those culinary debates to others with strong opinions while I smile and enjoy spoonful after spoonful of saucy, meat-rich, spicy heat with beans. Mmmmm, I do love a good bowl of chili (with beer). Cut pork loin into large chunks or thin slabs. Heat oil in heavy Dutch oven & brown meat on all sides. Do this in several batches, not crowding the pot. Remove & set aside. Cook sausage until no longer pink. Remove meat from pan and set aside. Discard all but one tablespoon grease. Add vegetables; cook over medium heat until they begin to soften, stirring occasionally. Add spices: stir and cook until fragrant, 1 to 2 minutes. Return meats to the pan along with the beer and stir to combine. Add tomatoes and their juices plus both broths (sufficient quantity to cover the meat). Bring to a slow boil, then reduce heat and simmer, partially covered, until meat chunks are tender. Add additional broth as needed. Taste and adjust seasonings as necessary. Add beans to the pot; cook long enough to heat. Remove pan from heat and let cool. The flavors will blend and mellow with a rest - overnight chilling in the fridge is good but not required. Reheat gently; taste and adjust seasonings again as needed. The spicy heat tames a bit overnight so I usually add generous splashes of Chipotle Tabasco or Green Tabasco to the pot. Serve with a choice of accompaniments: chopped green onions, shredded cheese, fresh cilantro, sour cream, lime wedges and/or diced avocados. For thicker chili I often add a handful of crushed tortilla chips, torn corn tortillas or stir in a slurry of masa (corn flour) mixed with water. 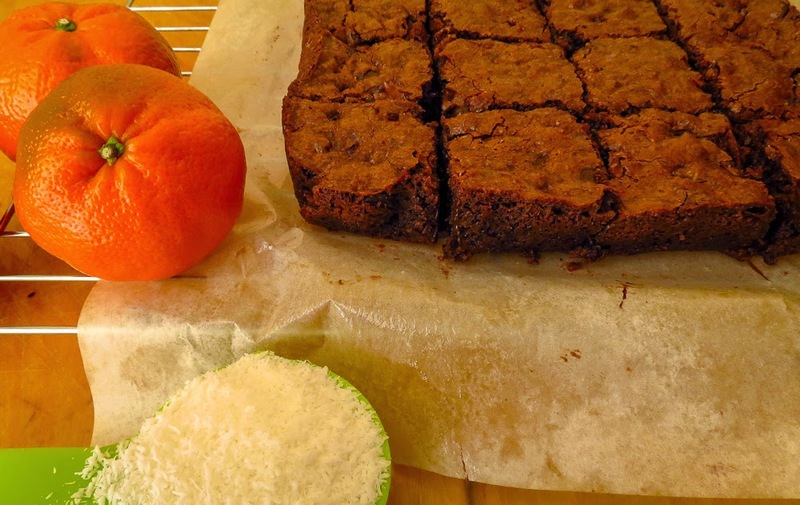 1. using a square glass baking pan instead of the silicone mini-brownie pan that caused so many problems in December (link). I've given up on silicone baking pans of any shape but continue to use and appreciate silicone spatulas and sheet pan liners (Silpats). 2. using the same packaged mix, but adding some grated orange zest and a half cup of unsweetened coconut shreds for a welcome flavor punch. Before these additions the first batch of brownies seemed too single-note chocolatey and tooth-achingly sweet; okay, but not great. Small amounts of citrus and unsweetened coconut made a discernible difference that we loved. 3. adjusting the suggested baking time of 20-30 minutes that had previously resulted in soggy, too-moist centers. 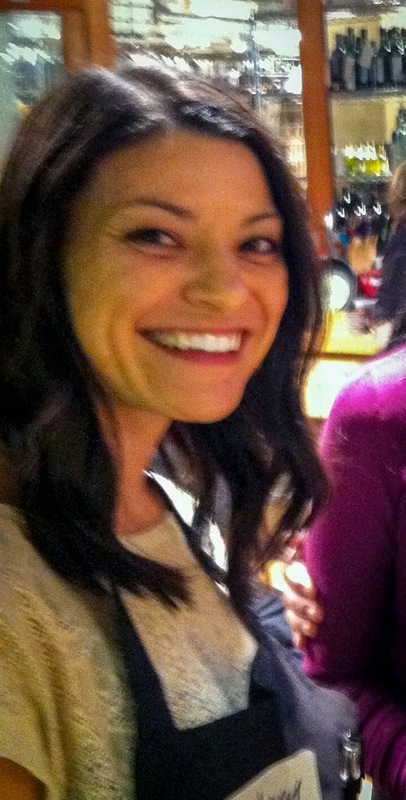 I added seven minutes and voila! ; 37 minutes was just enough to firm up the middle without creating overdry corners. An 8"x8" pan yielded sixteen squares of 2-inch brownies, enough dessert to last us for days. Maybe. After breakfast we snacked on brownie squares still warm from the oven, sampled "just-one-more" brownie later in the morning, and brownie bites topped with a cream cheese frosting studded with orange shreds for an afternoon snack. Who can resist such heavenly, sinfully rich, chocolatey-orange treats? Not us. 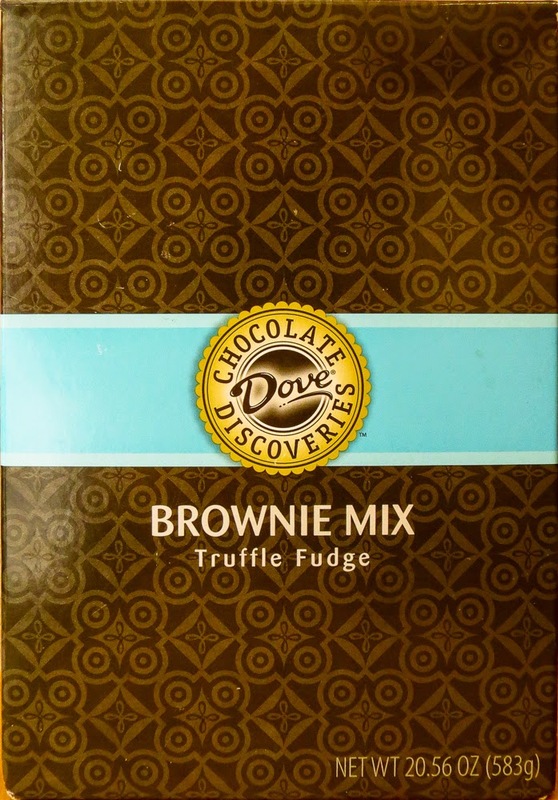 RL rated these Dove Truffle Brownies as better tasting than Ghirardelli and Krusteaz GlutenFree box-mix brownies, but that was after the addition of the orange zest and coconut. 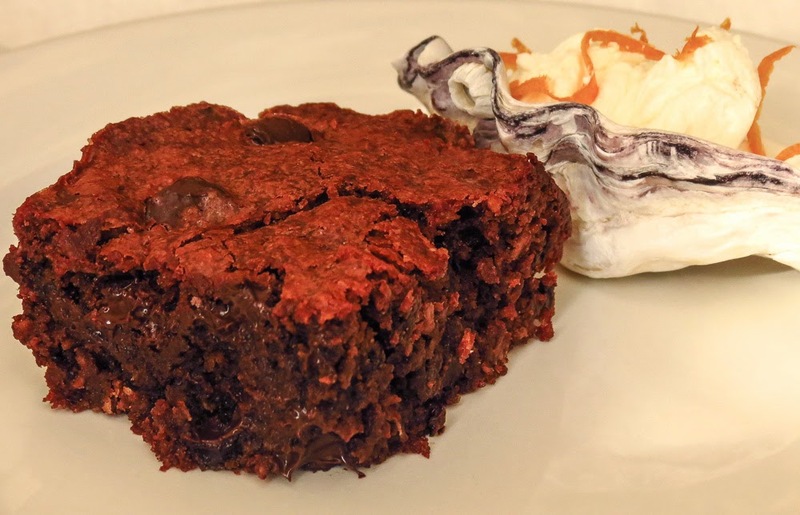 This quick box-mix brownie recipe can't top my favorite made-from-scratch recipe for Mexican Chocolate Sourdough Brownies with Chili (link), but they were a terrific answer to this morning's need for a quick treat. I had promised a landscaping crew that I would bake cookies for their return visit this week, today in fact. The brownies took 5 minutes to mix, 37 minutes to bake, 10-15 minutes to cool and... I must have mixed up the dates because the guys never appeared. Dang, we had to enjoy the brownies all by ourselves. Now there are only a few brownies left so I suppose I had better bake some cookies, just in case today is the day the yard crew returns. Calendar issues in my kitchen? yeah, it's the little things! This post was not a promo for Dove Chocolate products, though I do admit to a fondness for Dove Bar mini bites. The box of brownie mix was a bonus gift from a friend - thanks Laci! We enjoyed 12 of those 2-inch squares in two days, and shared the remaining 4 with the yard guys when they arrived this morning. 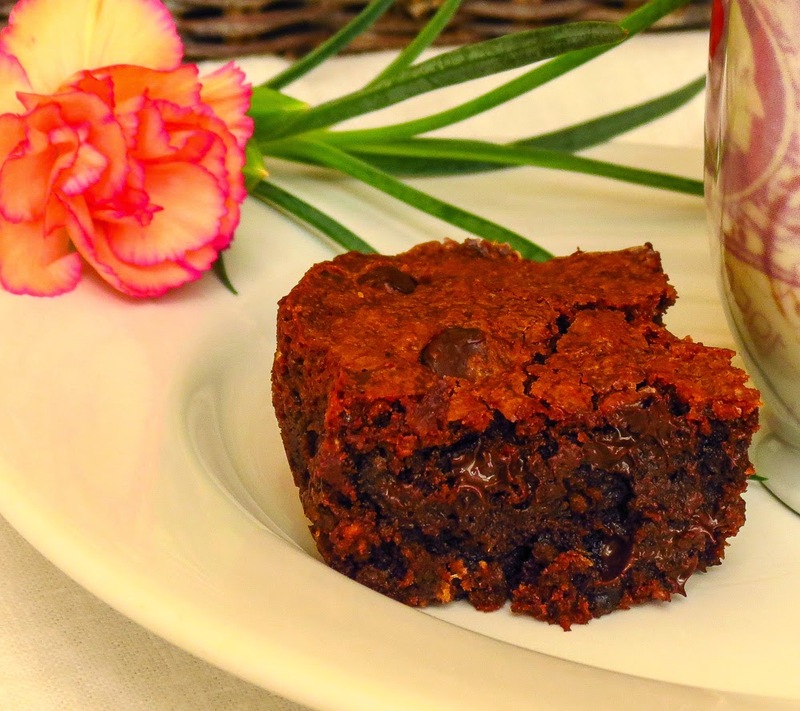 If you are looking for a seriously decadent nut-enhanced brownie, take a peek at joythebaker's latest recipe with three kinds of chocolate and three different nuts. Somehow we skipped a meal yesterday, a rare occurrence around here. Our very late breakfast meant sliding lunch into late-afternoon, and then we weren't hungry enough to eat dinner before turning in for the evening. Much later the tummy-rumble chorus started up loud and strong, signaling that it had been a l-o-n-g time between meals. Finally I couldn't ignore those increasingly annoying, noisy stomach gurgles and the impending threat of hunger pangs, either real or imagined. Fine! back downstairs to the kitchen to build a snack plate to share. We nibbled on stacked pear and cheese slices layered with a touch of jam, light fare but it quieted my growling stomach for the evening. Today I woke up hungry! eager for something savory, substantial and maybe even healthy. A sensible version of Cheese Grits qualified as substantial; sensible? well, they were cooked in water with no added milk or cream. I did add modest amounts of butter and cheese, forgoing my usual heavy hand with both of these ingredients, and doubled up the hot sauce for flavor instead. Sort-of-healthy? Sweet mini peppers, some white onion, cremini mushrooms, lacinato kale and assorted seasonings joined bits of smoky sausage in a loose beef stock sauce. That took care of savory and healthy, with added bonus points for the gravy coming together quickly while the grits bubbled away on another burner. 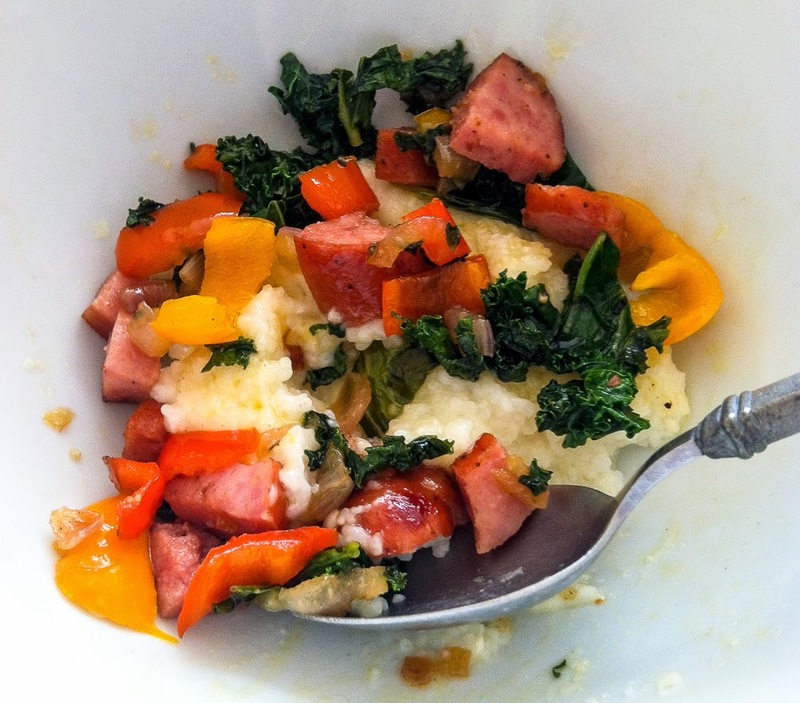 One heaping scoop of tempting, cheesy grits covered with a generous serving of the sausage and vegetable gravy, topped with a sprinkle of smoked salt and freshly ground pepper, made a deliciously filling breakfast bowl. OMG it was good! Both elements were tasty enough alone on a spoon, but a blended spoonful was terrific. The combination of smooth and crunchy textures, smoky and spicy flavors, plus pops of neon bright colors made this dish a two-thumbs-up winner. I'll cheerfully make this again for breakfast... or lunch... or supper, ashore and afloat. 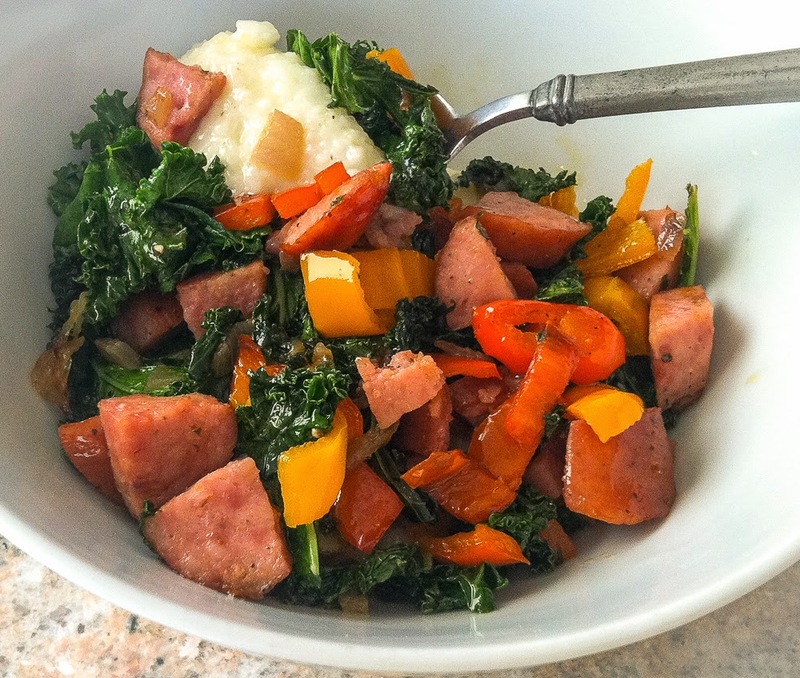 C'mon by and join me for some grits and savory sausage and vegetable gravy - and don't pass up the hot sauce. 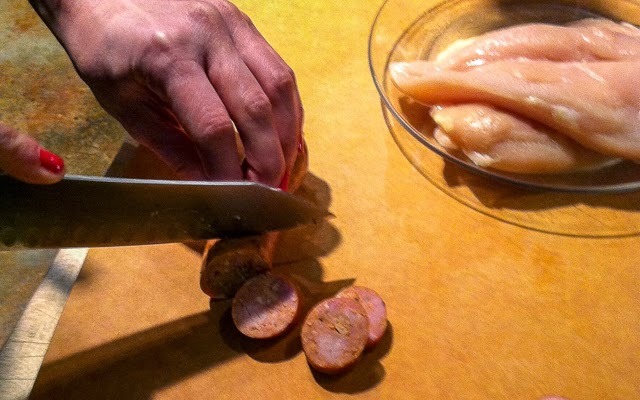 Slice the sausage lengthwise into quarters, then chop crosswise into 1/2-inch pieces. Dice the peppers, onion and mushrooms into pieces roughly the same size as the sausage. Chop the kale into bite-sized shreds. Add a two-count of olive oil to a heavy-bottomed skillet and warm over medium-high heat until shimmering. Add the sausage bits and cook to heat through and brown slightly, releasing any oils. Add the vegetables and garlic; saute until softened but not crispy. Stir in the oregano, thyme, ground black pepper and smoky paprika; heat until fragrant, 1 to 2 minutes. Sprinkle the flour over the pan; toss and stir to incorporate. Slowly add the broth and whisk or stir to blend thoroughly. Continue heating and stirring until gravy thickens and is smooth. Cook longer to thicken the gravy; add more broth if it seems too thick. Taste, adjust seasonings, add hot sauce to desired level of heat. Serve over Creamy Cheese Grits, sprinkle with smoked salt and pass the hot sauce. Enjoy! 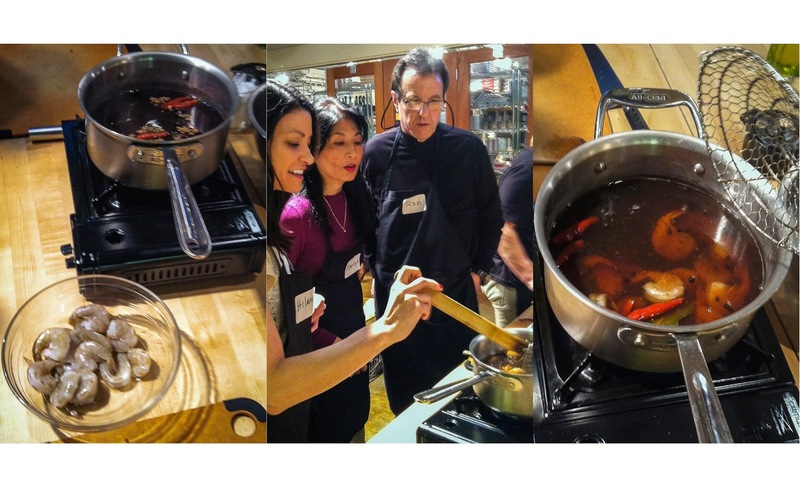 Billed as The Best of New Orleans, this Sur la Table cooking class featured a knowledgeable and humorous instructor (Chef Thanh Tang), a three-course and flavor-packed menu straight from NOLA, and an amiable group of sixteen students. Well, I can only speak for our congenial team of four, but no fights broke out anywhere in the kitchen. Flames and occasional shouts, yes, but no harsh words or fights. Photo: Our focused, smiling team at work in the Sur la Table kitchen. We built a new-to-me version of the versatile Louisiana remoulade sauce, a mayonnaise-based blend incorporating some sweet pickle relish, capers, anchovy paste plus a hit of Tabasco. 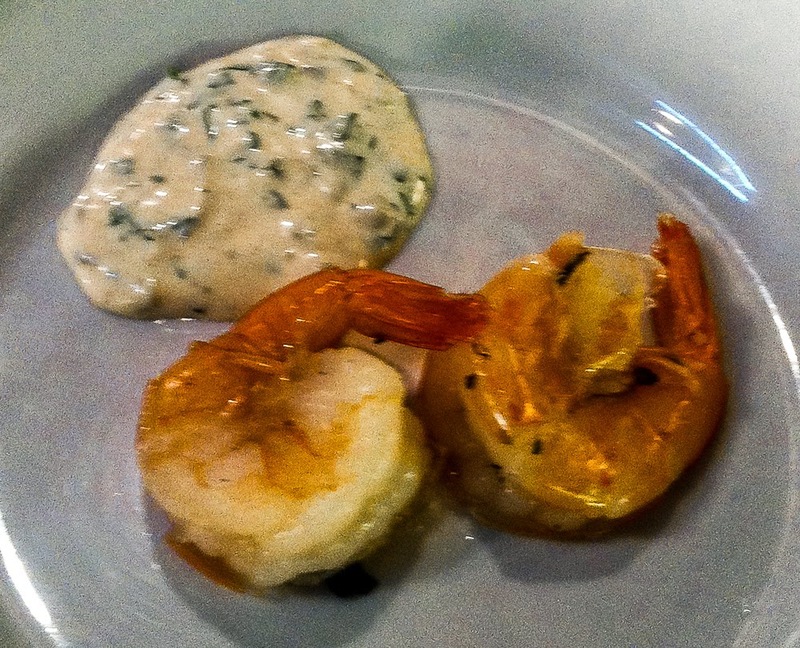 Akin to a zippy tartar sauce it added a nice flavor punch to the perfectly poached cold shrimp. Everyone had a part in the prep and cooking, sharing roles as cooks and as diners throughout the evening. 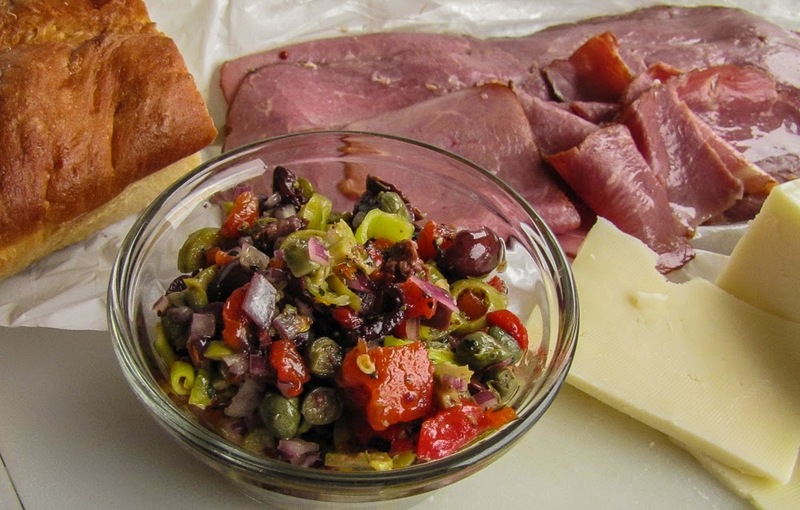 use 1-count, 3-count measures for oil; preheat to shimmering before adding food. We sliced, seared, sauteed, stirred, seasoned and finally savored two delicious dishes served with a scoop of perfectly cooked white rice... and now know the secret of cooking one-knuckle rice. Oh... My... Goodness... these were good eats! Photo: l. Okra joins the "holy trinity" of bell peppers, celery and onion; c. a simmering pot of red beans; r. bowls of gumbo and red beans and rice. 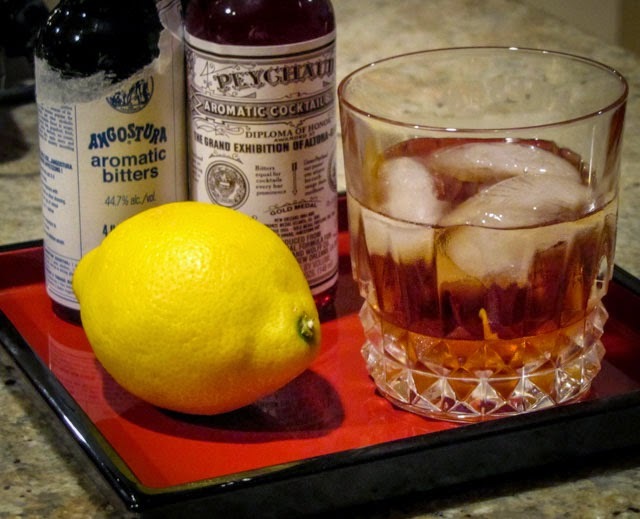 Photo: Five simple ingredients plus a little flame add drama to dessert. Heat some butter, brown sugar and cinnamon; add lemon-coated bananas and warm; stir in a little rum and continue cooking and stirring until warm. Then flambe! Easy peasy, right? 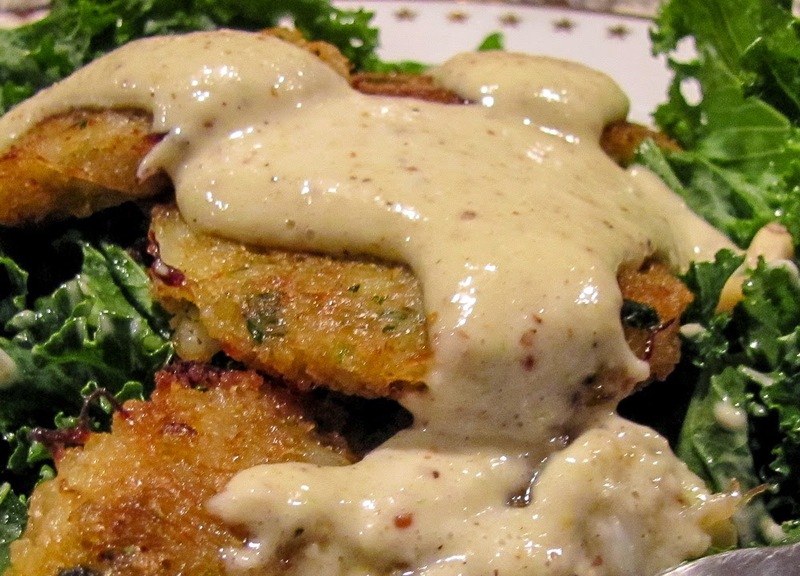 (Our sauce seemed faintly harsh in flavor - was it over-browned butter or was it the rum?) Generously spooned over a scoop of vanilla ice cream, this dessert disappeared quickly! Hmmm, know anyone who loves sweets? 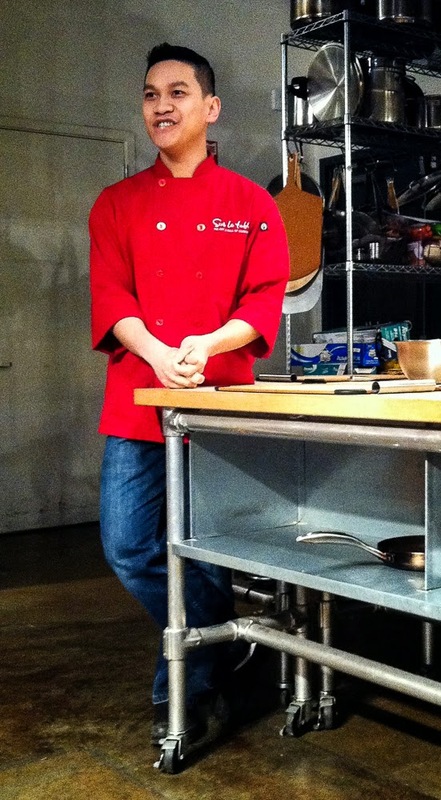 The class wrapped up with a review of recipes, techniques and cooking tips, plus hugs or handshakes all around. It's easy to bond over good food and a cooking adventure. *Fat Tuesday is the traditional name for the day before Ash Wednesday, the first day of Lent. It is more commonly known as Mardi Gras, which is simply Fat Tuesday in French. It gets its name from the custom, in many Catholic countries, of marking the day with feasting before the fasting season of Lent begins. Take a culinary tour through the sensational Southern flavors that combine rich Creole and spicy Cajun influences into unforgettable and exciting New Orleans cuisine. Experience a kicking' Southern-style remoulade, the famous trinity of bell pepper, celery and onions in a savory gumbo, and more delicious traditions. You'll love the vibrant, bold flavors of a menu that embodies pure Southern joie de vivre. 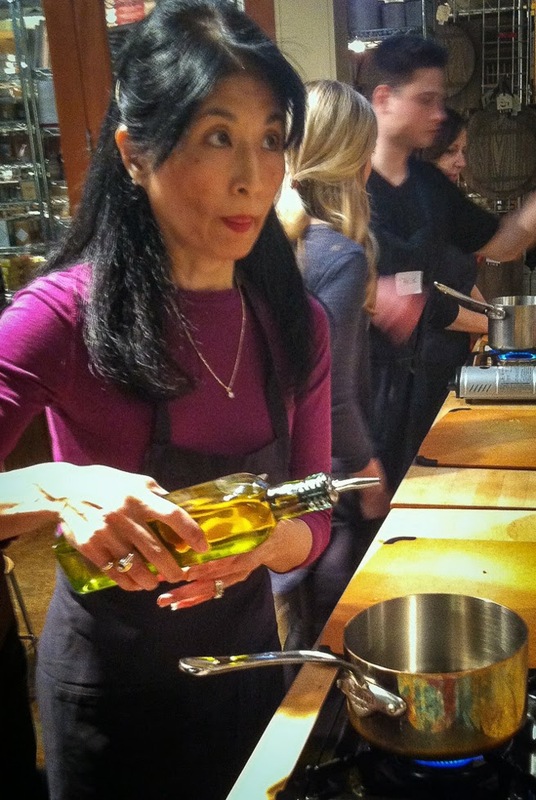 Great cooking isn't about recipes--it's about techniques. In our classes you'll work together with other students in a fun, hands-on environment led by our professional chef instructors. Now doesn't that sound like fun?! I love the published menu for tonight's class; these traditional dishes are already family favorites, but I look forward to the opportunity to explore new techniques and seasoning twists. Maybe I should pack a thermos of something alcoholic to get the party rolling... or maybe not, since sharp knives are involved. The Spinach Dip with Artichokes, Cheese and Chiles was a winner, but my throw-everything-into-the-mix approach yielded a lot of that thick, spunky dip. Spunky? You know, a dip with attitude. The quantity might be a bonus when you host a party, but it's not so terrific when you are feeding a twosome. Now what? 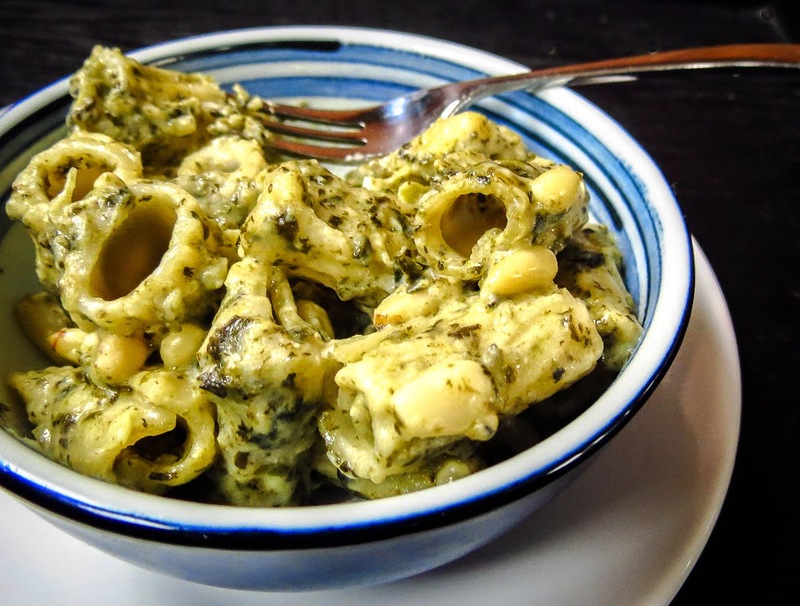 I used the peppy spinach dip as I might any pesto blend, adding it to a loose bechamel sauce along with pine nuts for a pasta topping. Mmmmm, yes! that made a pleasant pasta bowl for today's hot lunch, but now I'm eager to try an oven-baked version. Imagine a spinach pesto pasta macaroni and cheese sort of dish, with crisp, crunchy browned butter-tossed breadcrumbs on top. My taste buds are quivering in anticipation, but RL is losing his taste for spinach anything. OH! the fun I've had dealing with the challenge of that large, annoying 1-pound bag of frozen spinach. Prepare your standard béchamel sauce (white sauce); add a large handful of meltable cheese and heat to melt. Add more milk as needed to keep the mixture thin and loose. Add a cup or more of Spinach Dip with Artichokes & Chiles; stir over low heat until incorporated. Adjust taste and consistency as needed. Toss with your favorite cooked pasta and a generous handful of toasted pine nuts. Serve in a warmed bowl or on individual warmed plates. It all began with a well-traveled 1-pound bag of frozen spinach... seriously, well traveled. The label read "European Spinach" although it was packaged in China. I purchased it in British Columbia, stored it in the bottom freezer drawer throughout our 2000 nautical mile cruise in southeast Alaska, returned it to B.C. and finally thawed it out this week. Packaged in China? what was I thinking?! Likely I was in a last-minute provisioning rush and didn't pay attention to place of origin when purchasing. One pound is a lot of squishy, defrosted spinach; far too much of that healthy green vegetable to fill a dozen mushroom caps, stuff a few chicken breasts or even fold inside spanakopita. Spinach smoothies wouldn't be popular with RL for breakfast, neither would spinach quiche, spinach omelettes or a frittata. I searched the galley for inspiration, struggling to resist the temptation to quietly dispose of the bag and move on. Why had I even brought frozen spinach on board?! A quick tour of the galley turned up a block of cream cheese, a smidgen of sour cream, a carton of Parmesan shreds, several green onions, one tall tin of artichoke hearts, a can of whole green chiles, one large lemon, a handful of garlic and a pocket-sized bottle of green Tabasco sauce. Aha! that old standby spinach dip... or a riff on my favorite Costco artichoke and jalapeno dip... or some combination of the two. I went with the combination impulse. Layer most of the above items in the food processor, pulse to combine, taste and adjust. Let the machine do the work and focus on the taste testing. The fun came at the end when it was time to adjust the texture and play around with flavors. 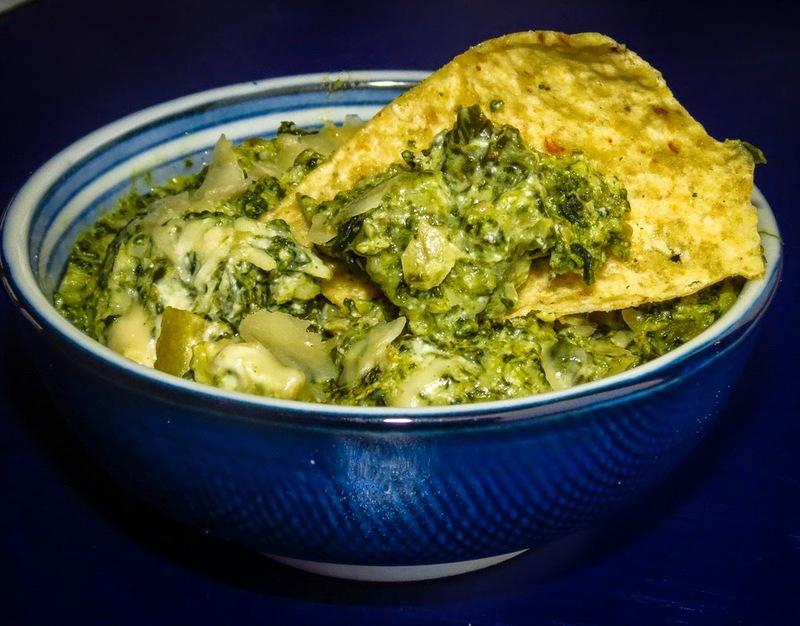 This version of spinach dip rated two thumbs up served cold with raw vegetables and crackers, but really drew raves after being heated in the microwave. YUM! Drat! I still had too much of a spinachy good thing for the two of us to enjoy as an appetizer snack. 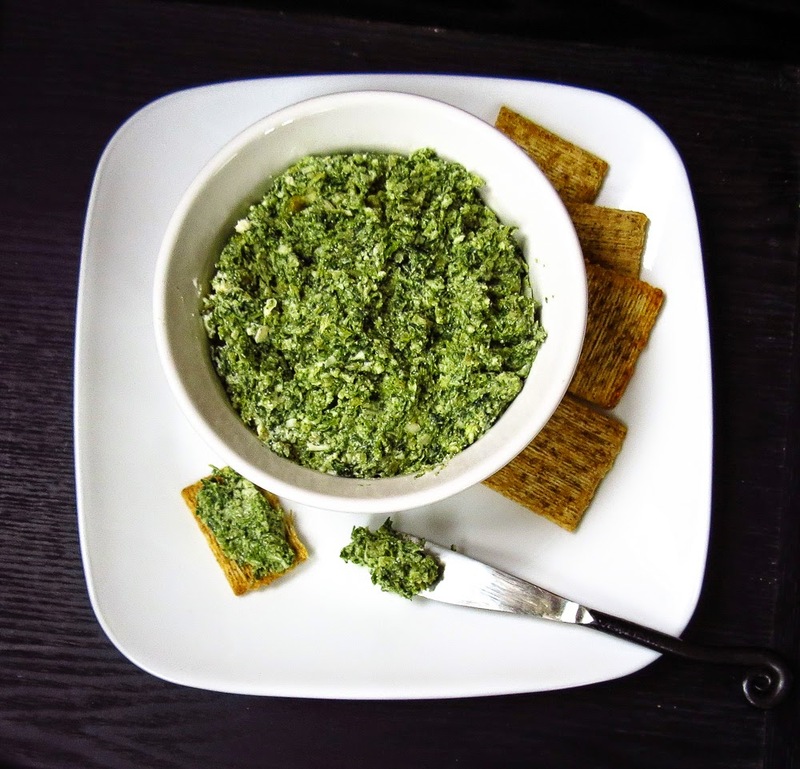 Fast forward to the next day (and my next post) when this versatile Spinach Dip morphed into Spinach Pesto Pasta. Toss everything into a large food processor bowl. Pulse repeatedly to incorporate; pausing occasionally to scrape down the sides. Transfer to a heatproof serving container. Warm briefly in a microwave or heat in a 350 F oven until bubbly, about 20 minutes. Or serve chilled or at room temperature. I could have spent hours watching a squadron of seagulls as they played in the wind, working the currents high aloft, seeming to hang suspended without ever flapping a wing, then suddenly climb or dive to travel at warp speed out of sight, only to reappear in view out another window. Instead of mentally soaring with seagulls I turned my attention indoors and flew in the galley, hoping to produce a fast yeast bread with some added sourdough tang. Fast and sourdough don't often mix. 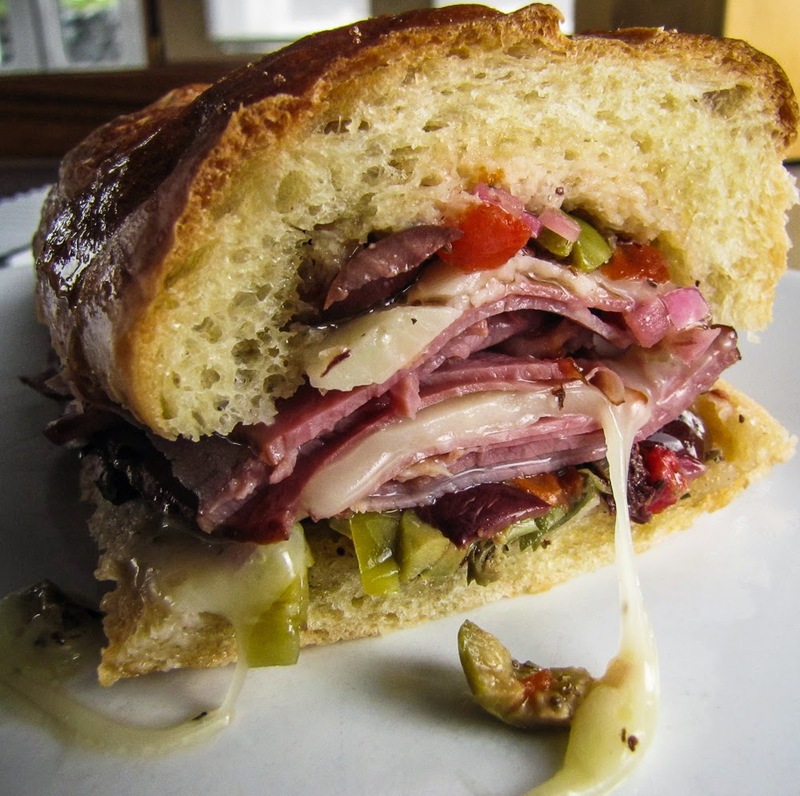 Fast-rise breads often sacrifice flavor and taste boringly bland. A true sourdough loaf requires long hours, even days, to achieve its rise and full flavor. Hoping for the best of both worlds I tweaked a Cookistry recipe and began mixing dough. The boat galley lacks a stand mixer but that's no problem; kneading is a therapeutic activity and I enjoy the process. Lacking a kitchen scale as well, I used quantity measures rather than weight for the sourdough starter and flour. I'll work out the weights when I'm back ashore, or figure out some out-of-the-way spot to store one more galley appliance. For now I'm working by feel to get the right ratio of liquid and flour. 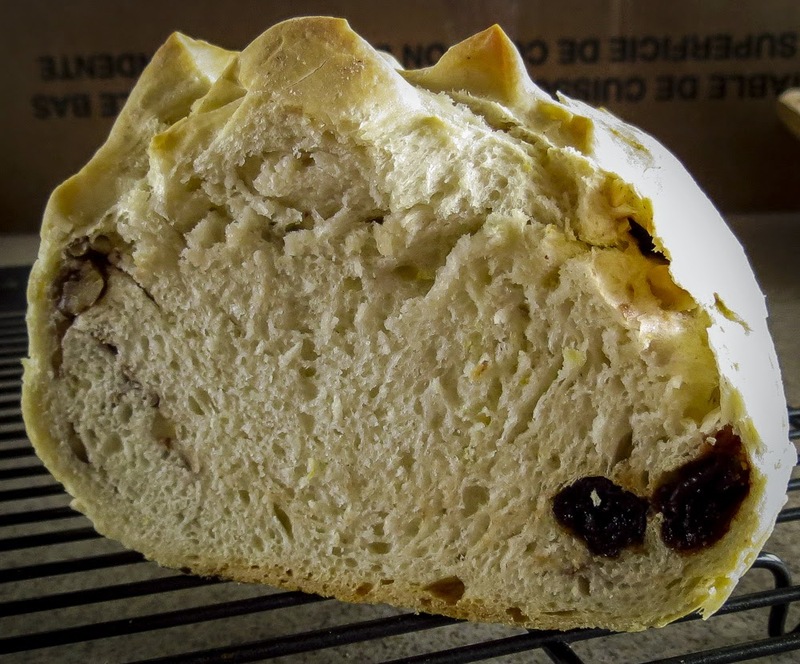 RL requested I incorporate his favorite bread additions into the mix - sour cherries and nuts. These add-ins have been problematic in previous sourdough loaves (link), tearing the surface and poking out of the bread only to scorch and burn in the oven. Fix #1: Rather than mix these ingredients into the dough, try the typical cinnamon roll technique: roll out the dough into a rectangle, scatter the fruit and nuts over the surface, then roll up and coil into a round (rather than cut into individual pieces). Fix #2: lower the oven temperature from 375 F to 350 F.
Success! the recipe produced two small rounds with a solid hint of sourdough flavor and featured a crisp crust with a tender crumb. 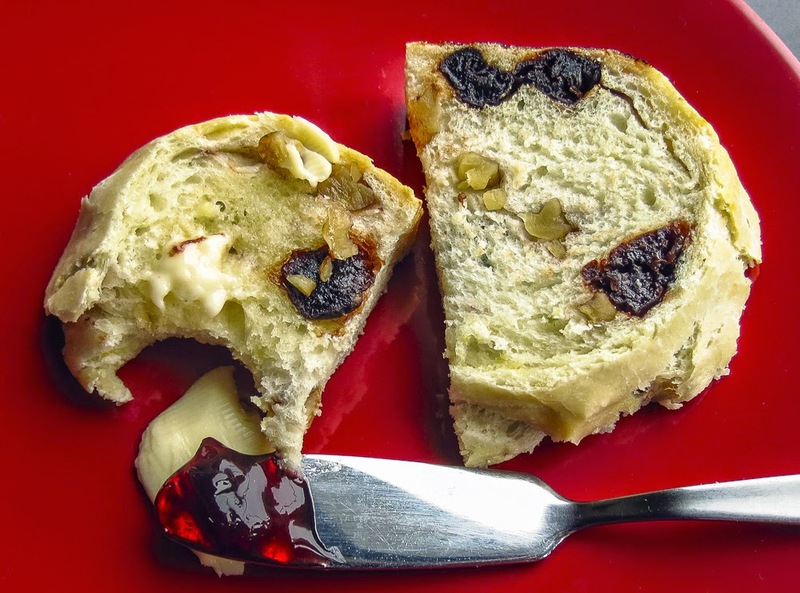 We eagerly devoured several thick slices, still warm from the oven, without butter or jam. Yum! Next we snacked on small chunks, slathered with salted butter and cherry jam (RL) or lingonberry jam (me). Again, Yum! Toasted for breakfast the next day the bread was still tasty. And by day three it was gone. Yes, I would make this recipe again, whenever short on time or patience. It won't match the flavor and texture of a traditional two-day sourdough, but it was a decided improvement on some other fast-rise loaves I have tried. ... the crisp crust, even though it never achieved beautiful golden brown status. ... the soft crumb and pleasant homemade, white-bread texture. ... the fast rise and ease of preparation. ... a flavor that had some presence. ... the lack of large, airy holes and the homemade, white-bread texture. ... increasing dry interior on days two and three. ... uneven distribution of cherries and nuts (the fault of the cook, not the recipe). It could be time to bake bread again... unless I'm distracted by the seagulls. In a large bowl whisk together the yeast, sugar and water, then add the starter and flour. Knead the dough, adding flour as necessary to achieve a silky and elastic texture. Add the lemon zest, salt and olive oil; continue kneading until both are fully incorporated. Oil the mixing bowl lightly, shape the dough into a ball and return it to the bowl. Cover the bowl with plastic wrap and set aside until the dough has doubled, (typically one hour in my galley. Remove the dough from the bowl, and shape as desired. Place on parchment, cover with plastic wrap sprayed with cooking spray, and let it rise until doubled, about 30 to 40 minutes. Remove the plastic wrap, slash the dough as desired, and bake at 350 degrees until browned and internal temperature reads 185-195, about 40 minutes.